For new buildings, and for buildings subject to major refurbishment, glazing requirements for critical locations are given in a combination of Building Regulations and British Standards publications. The various Building Regulations and British Standards have been written separately and at different times. As a result of this, even though the intentions may be the same, the wording and presentation will vary. 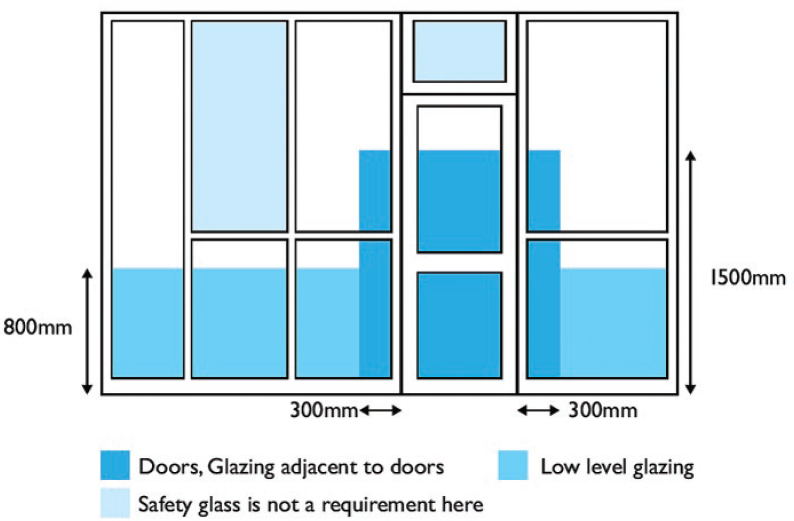 However, if the recommendations in BS 6262: ‘Code of Practice for Glazing in Buildings’ Part 4 ‘Safety related to human impact’ are followed, the current requirements of Building Regulations in all three regional areas of the UK for the glazing of critical locations will be satisfied. Not sure of the particular security or safety glass you need? please Contact us today on 02871 357 444. -or- E-mail us.